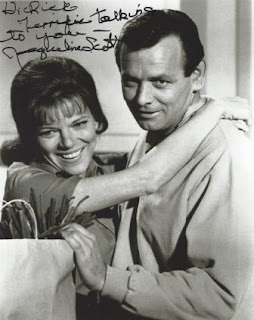 Jacqueline Scott and David Janssen in The Fugitive..
With over 100 credits, actress Jacqueline Scott has forged a remarkable career in film and television. She has worked with legendary directors such as Steven Spielberg, Don Siegel (multiple times), and William Castle. 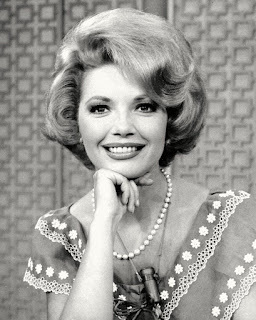 She made her biggest impact, though, with her guest appearances in many of the finest television series of the 1960s and 1970s. Here's a small sample, to include the number of episodes per series if more than one: Perry Mason (3 episodes), Have Gun--Will Travel (5), The Outer Limits (2), Bonanza (3), Gunsmoke (8), The F.B.I. (4); The Untouchables, Twilight Zone, Mission: Impossible, Route 66, The Virginian, and The Alfred Hitchcock Hour. Her most famous role may be as Donna Kimble Taft, the sister of Richard Kimble, on five episodes of The Fugitive.We spoke with the delightful Jacqueline Scott recently at the Williamsburg Film Festival. Café: What was it like playing Richard Kimble's sister in five episodes of The Fugitive? Jacqueline Scott: It was fabulous. It was wonderful. I finally had a brother! Café: Didn't you star with David Janssen earlier as a guest star on Richard Diamond? JS: Yes, but he didn't remember me and I didn't remind him. I don't why I didn't. David Janssen was very sweet and friendly. He probably would have been happy to know that. Café: You guest-starred on Perry Mason--another terrific series--three times. Between scenes, did you spend much time with series regulars Raymond Burr, Barbara Hale, or William Hopper? JS: Primarily Raymond. I also worked with Raymond on Ironside. He was a very special man. We shot court scenes on Perry Mason for two days. And on those days, he would have someone there to cue him the day before or else they worked at night. When he shot his scenes, he never used a script or a teleprompter. He knew his lines like the back of his hand...every single episode. Café: One of your first film roles was in William Castle's Macabre. JS: I was brought to California from New York for that role. It was my first part in film. The producers had seen me on live television. I had lived in New York for about six years. I'm originally from Missouri. Café: What were some of the live television series you did? JS: Armstrong Circle Theatre, Omnibus with Geraldine Page, and several others. Café: When I interviewed Piper Laurie, she said she loved live television because there was no margin for error. She thought it was exciting. JS: It was exciting. You had about three or four days for rehearsal. On filmed television, you rarely have any rehearsal at all. When you do the script all the way through for the first time, it's the last shot of the show. On television, they generally shoot for the weather, not the script. Anything that has to be done outside is done quickly before it rains (laughs). So, it's shot out of sequence and you have to put your scenes in context as you go along. It's a challenge. I loved the rehearsals for the live shows. Looking concerned in Castle's Macabre. Café: Back to Macabre, didn't you meet your husband Gene Lesser on the set? JS: Yes, we met on that film and we have been married for 58 years. Café: Did you think he was good-looking? JS: Oh, yes! He has naturally curly hair and they had pumped water and mud onto the Macabre set. The water made his hair curl even more and I thought I was going to have a heart attack! (laughs) Fortunately, I lived through it. He thought I was cute, too. Café: You've appeared in some movies which have become very famous over the years, such as Charley Varrick and Duel. What is your favorite film role? JS: I've enjoyed them all, but I loved working with Walter Matthau on Charley Varrick. I had admired his work for years. Don Siegel was the director. Charley Varrick was the first time I worked for him. I think I did about three or four movies with him and then he retired. He was a wonderful director and a funny and kind man. One day, he told me: "I don't know what your husband thinks about you working with these two crazy, old men"--referring to Walter Matthau and himself. They were both just nuts (laughs), but a wonderful actor and a wonderful director. 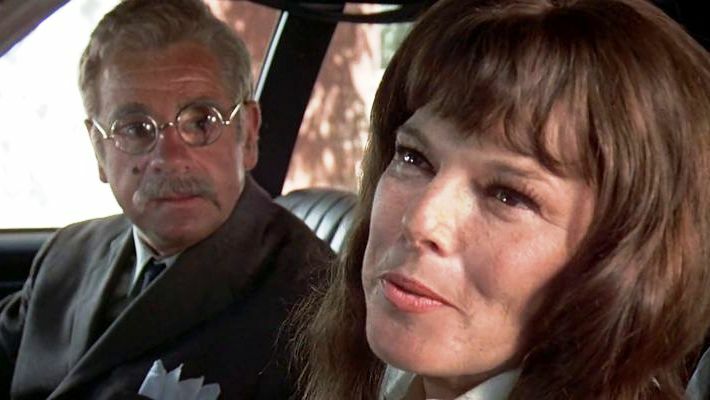 With a disguised Walter Matthau in Charley Varrick. 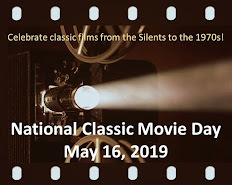 Café: You're introducing one of your films at a screening tonight: Empire of the Ants with Joan Collins and Robert Lansing. Any special memories of that film? JS: It was filmed in Florida, so when I was offered the role, my first response was: "I'm not getting in the water with any alligators!" The director (Bert I. Gordon) was odd. He would get us up at 5 a.m. for a casting call and then not start filming until 4 p.m. It rained during some scenes, so they had to spray us with hoses in later shots so everything would match. Of course, the real star of the movie were the giant mechanical ants. Café: You appeared in some of the truly great TV series of the 1960s. How would you compare television today with what it was like in the 1960s? Café: Did you ever turn down a role you wished you'd taken? JS: No. I wanted to do The Waltons. I tested for the mother. Other than that, I never wanted to be a regular on a TV series and I don't think that was too smart. Café: Were you offered a series? Being" on The Outer Limits. JS: Yes, but not necessarily anything great. I wanted to play all different characters. And I got to do that. Once I'd be the good girl and once I'd be the bad girl. You wouldn't want to hear: "While she's a good actress, she isn't able to do this kind of role." One director, Leo Penn--who is Sean Penn's father--would call me for anything. We had worked together when we were kids in New York and he was fabulous. Sometimes, there would be a part that people didn't think I could do. And Leo would say: "Well, it's the last minute and I don't have time to mess around meeting actors I don't know. I want Jacqueline." He'd push me for the part--and the producers would be happy he did. Café: What did you think of the young Steven Spielberg when he was directing Duel? JS: He was a youngster. He looked like he weighed about 150 pounds dripping wet. (laughs) But he sure knew what he was doing. Café: Thanks so much for taking time to do this interview. JS: It was terrific talking with you, Rick. * It's a common practice in film production to use color pages to indicate new pages added to scripts. Hence, a "white script" is one with no changes. Just watched the one where Kimble walks into a trap to comfort his sister, who's cracking under the strain. The interplay of the two is about as good as you get. A terrific interview as usual, Rick. Enjoyed her memories of Perry Mason - to your recollection, has anyone ever said anything bad about Raymond Burr? He seems to be as respected and liked a man as anyone in the business. LOVE HER! Yesterday I watched the "All About Andrea" episode of "Ironside" and today this interview! How do you do it? Awesome interview with the effervescent Jacqueline Scott! She especially had an excellent TV career and her resume is filled with episodes from some of the best shows that graced television. Also, I love the signed photo you posted from "The Fugitive." Another great interview! She sounds very charming. Always loved seeing her in guest spots, especially THE FUGITIVE. Thanks for a great interview. She knew how to blend into any role that she played. I agree that she and David Janssen had a very natural, sibling-like rapport on their FUGITIVE episodes. Her first appearance on The Fugitive was perfect. When she gets that phone call from Richard, she appears to genuinely break down with her surprise and joy. A wonderful scene for her. I still recall that scene, too. Wiping real looking tears of joy, fear, concern, relief. That is when I learned her name (from the ending credits, decades before google and imdb)! Have recognized her later on Perry Mason repeats and other roles as the actress who portrayed Richard Kimble's sister. 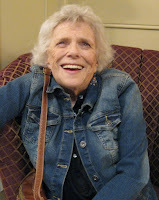 So glad she and her husband are still with us; sad they lost a son at 38 in 2003. A terrific actress who is always believable in any role she performs. My first memories of her are in the Twilight Zone and The Outer Limits. She could always create amazing depth to her roles without overpowering the caracter she was portraying. 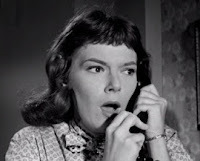 Aside from her role as Kimble's sister on The Fugitive, many of her other roles in Quinn Martin series, she was quite often cast as 'concerned wives'...on The FBI, she played the worried wife of Bradford Dillman, Gerald S. O'Loughlin, Michael Tolan and Earl Holliman;on Cannon, she played the worried wife of Keenan Wynn; on Streets of San Francisco, she played the worried wife of William Windom, and on Barnaby Jones, the worried wife of James Callahan. I think QM's casting director saw her as that type. Once, TV Guide did a feature on Jacqueline Scott. Part of the interview took place in a studio commissary. "Hey, five of my former husbands are here!" And that's why we all love TV! You can get the widescreen edition of Charley Varrick on DVD at Amazon now. European though, not US/Canada, but any player can now be set to Region 0 to play any DVD. Just Google for the instructions, and you will need your DVD remote. The usual US version is 133:1 and the widescreen is 185:1. I always thought they killed off 'Nadine' too fast in the movie, and that Scott should have gotten a bigger part. She was good playing Matthau's wife and getaway driver, even though her part was over in the first few minutes. One of the great films by Don Siegel for sure. TV Sidekick Blogathon: The Corvette in "Route 66"
The TV Sidekick Blogathon Is Here!